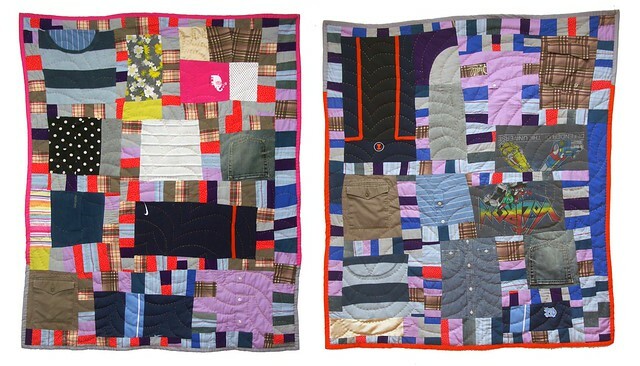 Carrie Hyun, in Portland Maine, contacted me in July 2011, about making two quilts from her husband Sam's clothing for her young children Ezra and Vera. Sam died of cancer at the age of 34, when Ezra was only four years old and Vera one. Carrie sent me Sam's clothes which included dress and casual shirts, sports clothing, shorts, jeans, and sweaters, along with a few pieces of clothing from each of her children, and a red nightgown of her own. In order to work within Carrie's budget, we decided on smaller sized nap quilts suitable for her young children, limited the amount of clothing items to ten, and settled on a simple one patch improvised design with striped sashing. 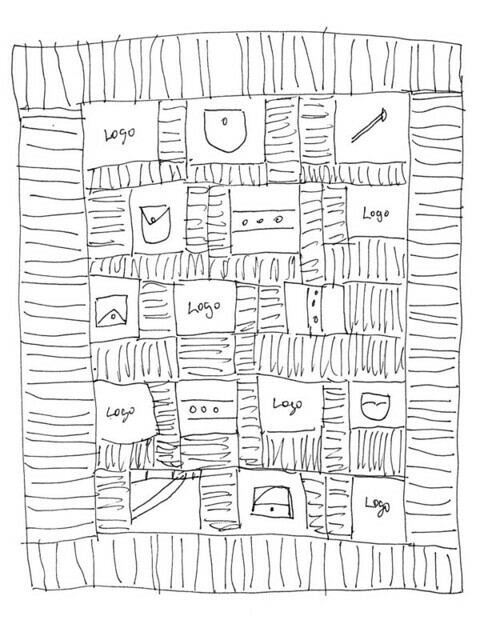 I cut the clothing she sent into large blocks in such a way as to feature different architectural elements, such as a pocket, a logo, a ruffle, etc. I then made striped fabric from the rest of the clothing in different color ways for each quilt. 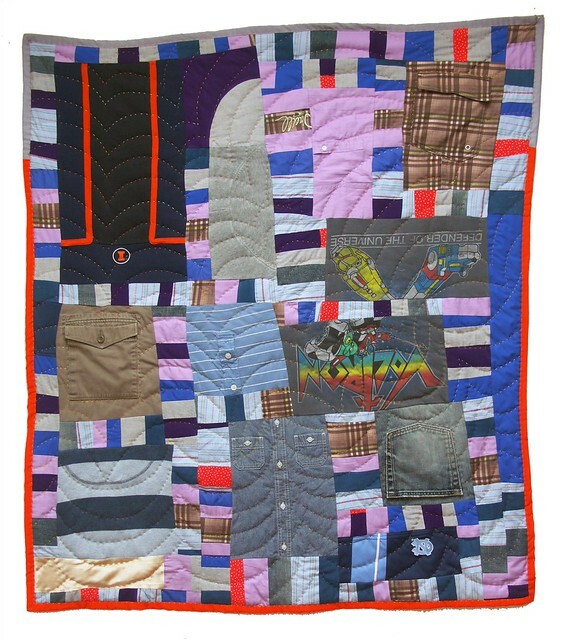 The quilts were approx. 55" x 45", machine pieced, hand quilted, and took 11 hours each for a total of 22 hours to complete. 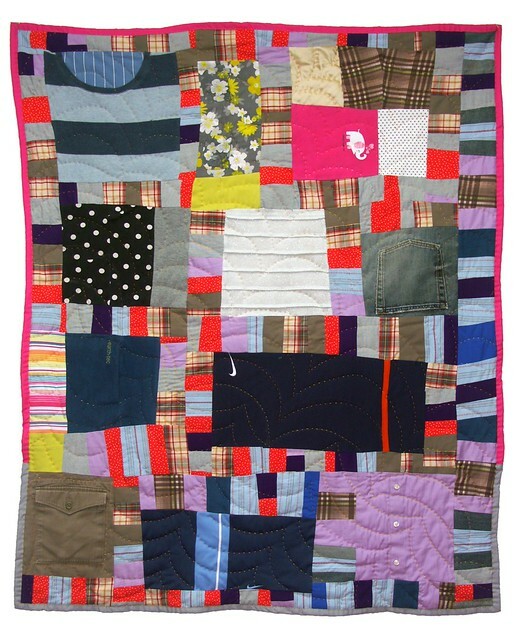 For more information on Passage Quilting as a bereavement process, or to see more examples of memorial quilts, please visit my other website ~ PassageQuilts.com.